It's that season again. That time of year when you're going to be invited to parties and gatherings and people are going to ask you to bring things. No, not presents...FOOD! We attended a party yesterday of the "please bring something to share" variety, and I decided to bust out an old appetizer recipe that I haven't made in a while, Herb Roasted Mushrooms. This used to be my go-to recipe to bring to parties and I guess I must have found something I deemed better to replace it, because it's been YEARS since I've made it. And then after buying three pounds of mushrooms and standing over the sink brushing all the dirt off them, I remembered why I might have stopped using this recipe. But please don't let that scare you! Cleaning the mushrooms is the hardest part of this whole endeavor. Once that's done, you toss all the 'shrooms in some lemon juice, olive oil, and herbes de Provence, and shove them in the oven! You do have to take them out and turn them over, but only once, and then you're pretty much done! You can also make them ahead of time! All that oven time does something magical to the mushrooms, they shrink down to herb-y delicious little morsels. The boy-fiance, who is not a mushroom fan, declared them good, so that's got to say something. I brought them to the party with a box of toothpicks and that's it. However, there were plates of meat there, and people started skewering a mushroom and a small piece of steak and making mini shish kabobs! Which made me think you could do a whole appetizer spread like that! All sorts of small pieces of veggies and meats and let people build their own mini kebabs! Okay, I'm getting ahead of myself. I'm going to give you the recipe for the mushrooms, and you can do whatever you want from there...but if you try the build your own mini kebab thing, can I crash your party? This recipe is from an old issue of Food and Wine, and all I have is the photocopied page, so I can't even tell you how old it is. I tried to see if I could find it on the F&W site, but no dice. It was in an article about Hors D'Oeuvres by Bob Chambers. 1. Preheat the oven to 450 degrees. In a medium bowl, cpmbine the lemon juice with the herbes de Provence, hot pepper sauce, salt, and pepper. Stir in the olive oil. Add the mushrooms and toss until coated. 2. Spread the mushroom caps on a large nonstick baking sheet, stemmed sides up. Bake for 30 minutes. 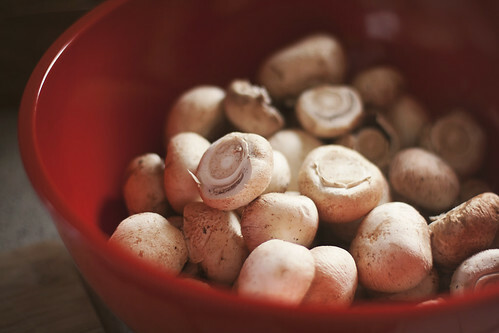 Turn the mushrooms over and continue baking for about 15 minutes longer, or until tender. Let cool completely before serving. \n\n\nIt's that season again. That time of year when you're going to be invited to parties and gatherings and people are going to ask you to bring things. No, not presents...FOOD! \n\nWe attended a party yesterday of the \"please bring something to share\" variety, and I decided to bust out an old appetizer recipe that I haven't made in a while, Herb Roasted Mushrooms. This used to be my go-to recipe to bring to parties and I guess I must have found something I deemed better to replace it, because it's been YEARS since I've made it. \n\nAnd then after buying three pounds of mushrooms and standing over the sink brushing all the dirt off them, I remembered why I might have stopped using this recipe.\n\nBut please don't let that scare you! Cleaning the mushrooms is the hardest part of this whole endeavor. Once that's done, you toss all the 'shrooms in some lemon juice, olive oil, and herbes de Provence, and shove them in the oven! You do have to take them out and turn them over, but only once, and then you're pretty much done! You can also make them ahead of time!\n\nAll that oven time does something magical to the mushrooms, they shrink down to herb-y delicious little morsels. The boy-fiance, who is not a mushroom fan, declared them good, so that's got to say something.\n\nI brought them to the party with a box of toothpicks and that's it. However, there were plates of meat there, and people started skewering a mushroom and a small piece of steak and making mini shish kabobs! Which made me think you could do a whole appetizer spread like that! All sorts of small pieces of veggies and meats and let people build their own mini kebabs!\n\nOkay, I'm getting ahead of myself. I'm going to give you the recipe for the mushrooms, and you can do whatever you want from there...but if you try the build your own mini kebab thing, can I crash your party?